After Robert Taylor’s smash hit as a knight in Ivanhoe, and a follow-up in Knights of the Round Table, MGM dug up another Walter Scott potboiler in Quentin Durward to try for three. 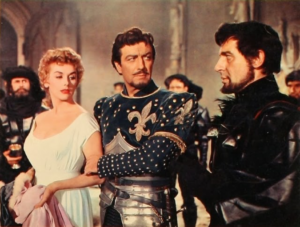 The result is mixed at best: the novel doesn’t adapt well to the Hollywood treatment, being slow to start and taking too long to explain the politics of 15th-century France; the romance is obvious and perfunctory, with the talented comedienne Kay Kendall miscast as an over-serious countess who never gets a funny line; the villain is a cartoon caricature, the depiction of the funny Gypsy sidekick is an ethnic abomination, the costumes, gear, and settings are rife with anachronism, and the dialogue is one sad cliché after another. But there are two important reasons to watch it anyway, especially the scene where … but wait. We’ll get to it. Scottish knight Quentin Durward (Taylor) is summoned by his elderly uncle, who’s contemplating matrimony, and after a few unfunny Scots-are-stingy jokes Durward is sent to France to inspect the prospective bride, Countess Isabelle (Kendall)—and her dowry. She’s a ward of Charles the Bold, the Duke of Burgundy, who’s marrying her off against her will to Durward’s uncle for a Scottish alliance. There follows an hour of court politics with brief interludes in which Durward displays his manly courage. The knight is represented as a romantic but obsolete relic of chivalry, and in fact throughout the film all his plans rely solely on reckless bravery. How can Isabelle fail to fall for him? Durward follows Isabelle from the court of Duke Charles to that of his rival and nominal monarch of France, King Louis XI. And finally we get to a place where the movie is worth watching, because the wily and shameless King Louis is played to perfection by Robert Morley, at the height of his wry, eyebrow-waggling powers. He’s just so good. Naturally the king co-opts the honest and simple Durward and employs him as a tool in a rather unlikely scheme, a plot that will result in Isabelle being forcibly married to La Marck, “the Beast of the Ardennes,” that cartoon villain mentioned earlier—after Durward’s inevitable heroic death exculpates Louis, who assigns him as her bodyguard. Away from courts and kings, the last third of the movie kicks into gear at last, as La Marck’s black-clad goons come out of hiding to menace our knight and his countess. Taylor gets to do some very credible swashbuckling in a running fight at a country inn, and then successfully gets the countess to the forest-girt castle of her uncle the archbishop, where she will presumably be safe. But La Marck uses Louis’s gold to buy cannon, the walls are breached, and the foxes are in the henhouse. Which brings us to the other compelling reason to watch this flick, the absolutely crazy final duel between Durward and La Marck, both of them desperately swinging back and forth on bell-ropes high in the top of a burning cathedral belfry as the bells toll out above them. It’s glorious madness, and not to be missed.